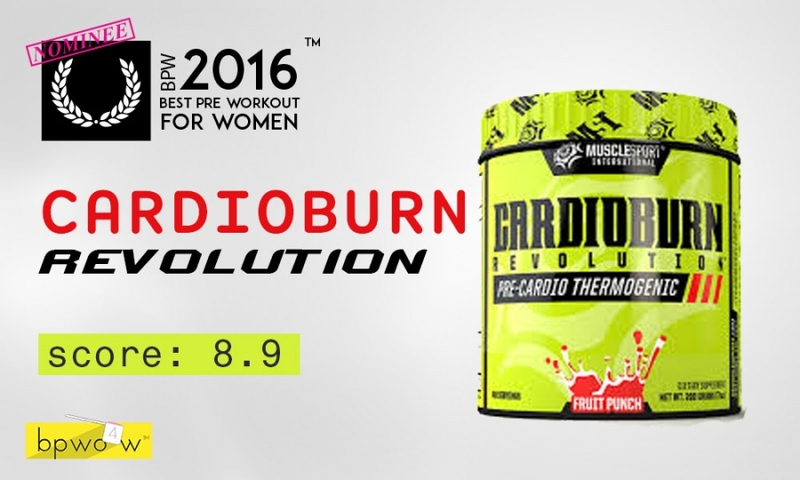 Cardio Burn Revolution is described on the packaging as a pre-cardio thermogenic. Now what that means is that this product is going to get my metabolism fired up so that I sweat that a crazy person while I do my cardio. As if that doesn’t happen already. LOL. I did a little bit of research on MuscleSports various social pages because I was not aware of this product until I came across it on Instagram. Actually the way I stumbled on this company is because of a silly pic that came across my IG ‘discover’ feed. It was a picture of some sort of action figure holding a bottle of one of their supplements, with a ridiculous caption on it. Well I guess it wasn’t that ridiculous because I don’t remember what it said, but anyways. I sifted through some of MuscleSports Instagram feed and then I saw that they had the pre-cardio formula. I’ve tested various products like this before and I admit they have worked out quite nicely for me. If you recall way back in 2013, the Cardio Cuts formula actually took home the (bronze I think?) medal for third best overall pre workout for women. Not too shabby. Other products like Cardio Igniter have done nicely too. So I was pretty stoked when my jar of Cardio Burn Revolution came in the mail. Before we talk performance, let’s start with the most important thing of all: THE TASTE. I’m giving Cardio Burn Revolution a simple ‘B’ on the taste because while I was clearly not blown away by it, I actually found it to be very drinkable. The flavor that I tried was the Raspberry Ice. If you came here trying to decide on what’s the best flavor of Cardio Burn Revolution, I’m afraid I won’t be of much use because I have yet to try the fruit punch flavor. BUT. If I were you I would go ahead and get fruit punch because the raspberry is kind of underwhelming. The taste itself starts out really really good. The initial taste is sweet, and gives you a strong raspberry note right off the bat. The sweetness is smooth and familiar. I would equate the sweetness to the ‘bubble tape’ sort of sweetness. Do you know what I’m talking about? Like the powdery sugar coating on it. That’s kind of what Raspberry Ice Cardio Burn Revolution starts out tasting like. Unfortunately things go just a little south from there. A significant amount of bitterness starts to take over and really sort of compromises the taste profile in my opinion. Now. I’m not saying it’s a bad tasting pre workout. It’s really pretty drinkable. It’s just not perfect, and not among the best that I’ve tried. I think that the presence of the Green Coffee Bean Extract is what really makes this taste tough to nail. I’ve had other products with GCB in it and they also leave something to be desired with the taste. For the record, I used one and a half scoops in about 10 oz of ice cold water- which is usually the optimum amounts of everything for pre workout greatness. It sets it up for the best chance of success. You might actually get a better taste using just the one scoop. Ok. Taste is wrapped up. Let’s talk PERFORMANCE. I was impressed with Cardio Burn Revolution when the time came to actually get into the workout side of things. I want to tell you about how I used Cardio Burn and how it impacted MY workout today. It’s all about ME. LOL. I’m so weird today I don’t know what’s going on. Oh wait yeah I do, it’s Saturday and I’m not focused at all. We’ll get through this though, together. Right? Right. So my workout today was actually the most hellish and brutal workout you can ever even imagine. You rowers out there, you knew exactly what I was talking about when you read the adjective ‘hellish’. Because there is no other way to describe the dreaded 2k row test. Yep. If you think you’ve done some tough cardio workouts, try SELLING OUT on a 2k. You will feel as close as you’ve ever felt to dying. I almost get the chills thinking about how it feels during that 800m mark- when you feel like you’ve given almost everything that you have, and you aren’t even halfway done. What is it that Bane says in Batman? “Without hope there can be no despair”? I don’t know if it directly applies to this, but definitely the ‘despair’ part does. I took Cardio Burn about fifteen minutes before my session on the good ‘ol ERG. I got on that thing just as the beta-alanine didn’t kick in. Because there isn’t any in here. But there is caffeine. And a pretty stiff dosage of it. I could certainly feel the energizing effects start to kick in and my desire to crush my workout became overwhelming. I hopped on, took a few good pulls, and I was off. The first 500m went quickly, as in true ‘Allie’ form I sold out most of my energy immediately. That’s what you’re supposed to do with cardio right? Wrong. I was gasping for air just 600m in. But then, near the 750 mark, I could feel something happening. And what was happening was a combination of my body battening down the hatches and saying ‘ok we’re actually doing this’ AND Cardio Burn For Her starting to hit my bloodstream completely. My brain was overtaken by the Energy and Focus matrix, and before I knew it- I was on the final 500m stretch. With Anita (one of my newest and bestest fitties) screaming in my ear, I let my form degrade, my desire peak, and I sprinted through the finish for a time of 8:42. Not so bad for me! To summarize the performance effects of MuscleSport- it gives a super good energy and focus rush to the point where your muscles simply have to obey you. They have no choice! Let’s take a deeper look at the ingredients in Cardio Burn. If this was a 100% transparent formula, I would have given it an A. I like the combination of these ingredients for the purposes of the product. The Fat Incineration Matrix is mostly carnitine (in two forms), along with some Panthethine (from Pantothenic Acid), and also some CoQ10. The Carnitine is what does the heavy lifting from a fat burning perspective, though. I can’t tell you that I personally experienced fat loss from the one time that I’ve taken it so far, but LCLT and Glycine Propionyl-L-Carnitine have some performance enhancing effects beyond fat oxidation as well- so I’m pretty sure I felt those during my row. Moving into the energy and focus matrix, you can see caffeine as the primary ingredient in here. And a pretty heavy dose of it, at that. 275mg per dose means that my scoop and half was over 400mg of caffeine. Errr. No wonder I felt energized! Other things in the Energy and Focus matrix are Halostachine (which acts like synephrine, to my understanding), and also Rauwolscine- a super trendy stimulant and fat burner. The Coumabuterol Matrix is basically higenamine and halostachine. These two ingredients work together to give that ‘sweating buckets’ effect that you will probably get if you take Cardio Burn Revolution for some extended cardio, which I did not do. The Anti-Catabolic Matrix is 2 gram blend of BCAAs and glutamine- essentials these days for a pre-training formula of any kind. At 2 grams, it’s not a bad dosgae of them either. Of course the BCAAs role is to help protect muscle from being metabolized for fuel during extended bouts of exercise, and to therefore improve endurance capability. Overall this formula is cool. It’s certainly ‘off-the-beaten-path’ for pre workout supplements, which I really dig. The energy and focus complexes really really do get you fired up. The additional ingredients show a combination of stevia and sucralose, which is also unique. Usually it’s either all artificial (sucralose), or all natural (stevia). Alright. let’s talk packaging. There’s something oddly appealing about the entire visual package of Cardio Burn Revolution. The Green Color with the Musclesport background logo in off-green design provides a nice bold backdrop to a bold and deliberate product title and product purpose. The MuscleSport team did a good job making the title clear and legible, while telling you exactly what the product is for also. The thing I’m not crazy about is the half-baked ‘splash’ graphic at the bottom of the label. It just looks kind of cheap and ugly. But I guess the color does provide an outlet for that complementary color, so that it’s not ALL green green green. It’s hard for me to put my finger on one certain thing that makes this design work. The supporting graphics and copy that adorn the sides and back all sort of go together in unison to create the feeling of sportiness. I think the package reinforces the product experience that I felt. THAT’s why I like this package design.